Designed for low cost flow/no-flow monitoring. 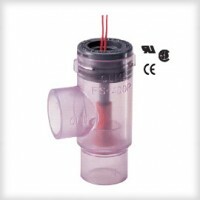 This flow switch series is available with a clear, transparent PVC housing which is ideal for use where visual flow confirmation is desirable. These corrosion-resistant switches offer broad chemical compatibility. With only one moving part, their rugged construction offers long life with minimum maintenance. Ideal for water heating or purification, equipment cooling and general chemical processing use. Process Systems: water filtration and reverse osmosis, chlorinators, de-icers, sterilizers, evaporators.